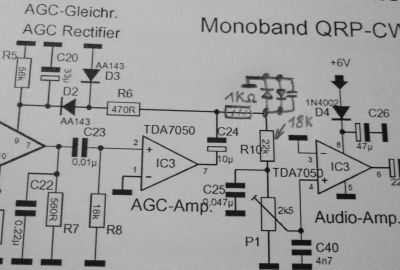 Miss Mosquita was the first QRP transceiver which I didn't design myself. But this little cutie by DL-QRP-AG caught my eye at a hamfest, so I bought the kit (for a very fair price) and assembled it in some hours on one weekend. 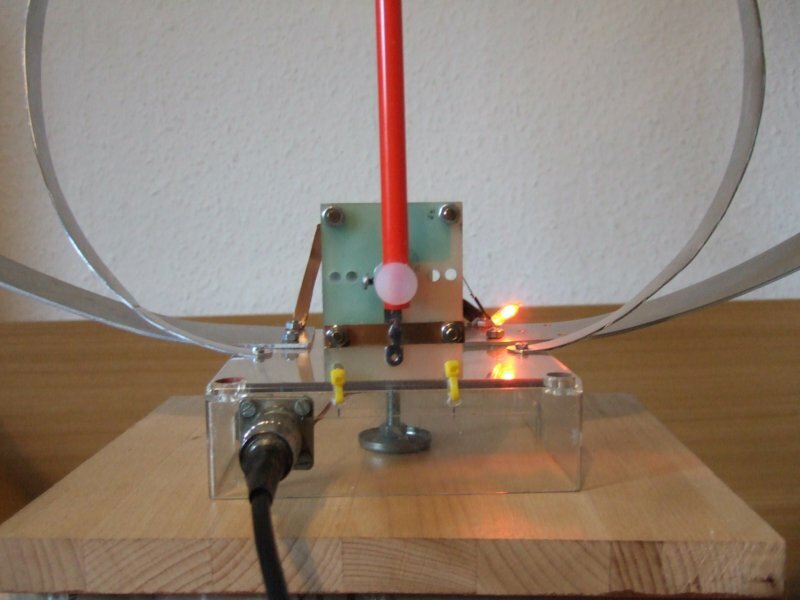 The construction is very simple, and if you follow the detailed step-by-step instructions there should be no problem to get it running - my Miss Mosquita worked properly right from the start. Only for personal taste, I made two minor modifications which are described below. The seven-segment frequency display is my first prototype (details about the counter are here; the counter which can be ordered as a kit from QRP-project is basically the same with a slightly modified layout). The boards are mounted on a copper-clad board which was inserted in a slot of the aluminum housing (like a "motherboard" holding the transceiver- and the TRX board in place). Three screws soldered (!) to the "motherboard" are used as bolts which hold the Mosquita PCB in place. I didn't remove the black adhesive stuff from the ex-photographic PC board material. 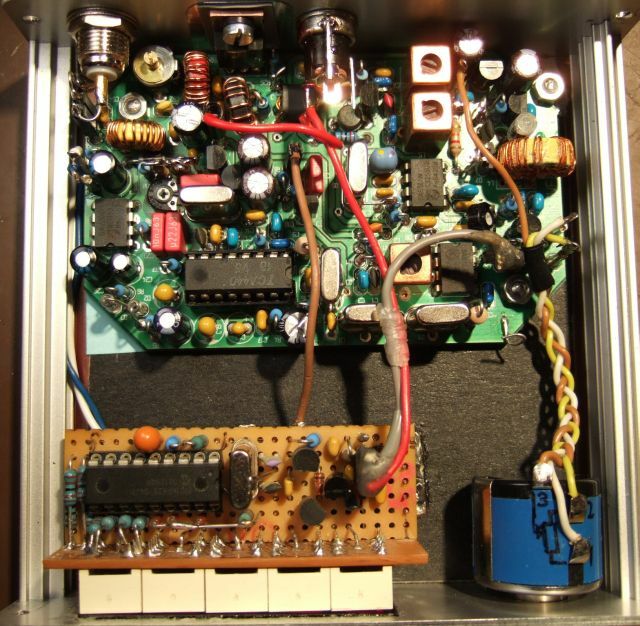 replaced C45 (100 nF) in the TX-driver stage by 2.2 nF, because the gain of T4 and T5 (TX preamp and driver) was a bit too high for an easy adjust the output power. 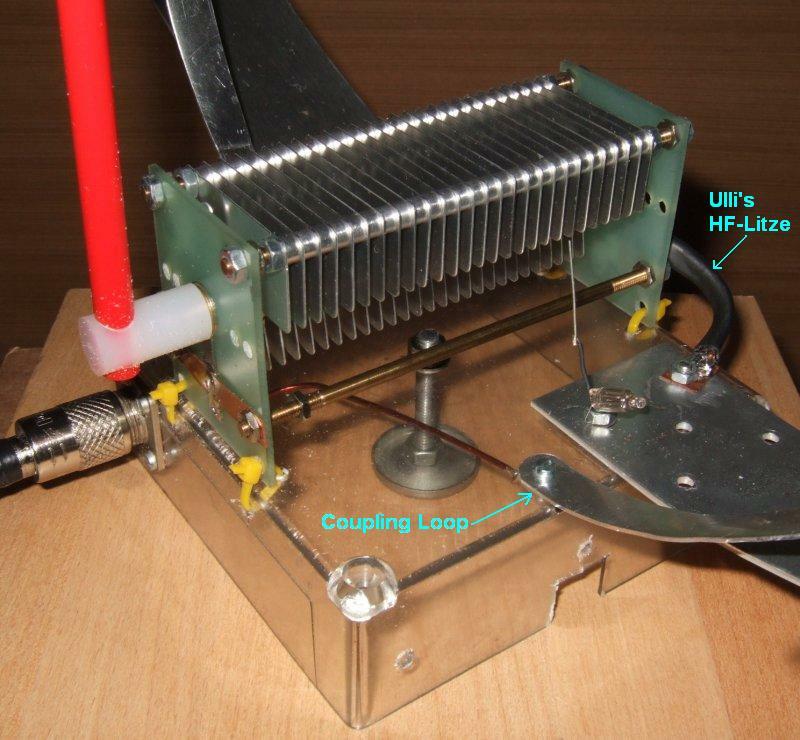 With 2.2 nF (= -j*10 Ohm) in the emitter, there is less gain, but still enough driving power to reach 5 watts, and the power is a bit easier to adjust with P3 now. The VFO can be easily tapped for the (LED-) frequency counter between R15 (820 Ohm) and P3 ( 250 Ohm to ground). 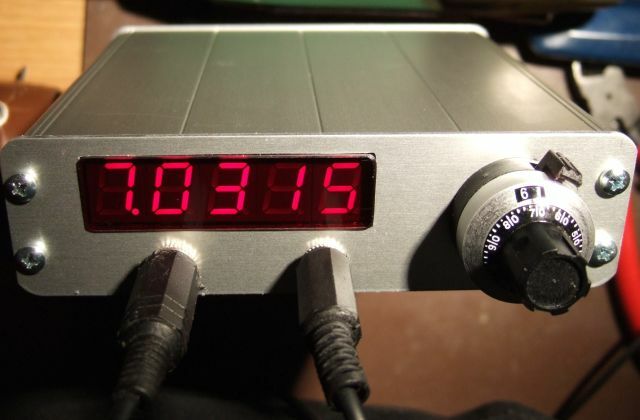 Connect the pushbutton to (DL4YHF-) frequency counter. You only need that button temporarily, so there's no need to install it in the front panel ! Turn Miss Mosquita (and the counter) on. If there is no IF offset programmed yet, the counter may show something like "3.0310" (MHz) now. Shortly press the button a few times until the display shows "tAbLE"
Now press the button a bit longer, until the selected menu (here: "TABLE") starts flashing. This takes you into a sub-menu where different preconfigured frequency offsets can be recalled. Now press the button for a second (until the display flashes "3.9990"). Release the button when the display flashes. After this, the counter asks you if that frequency shall be added ("Add") or subtracted ("Sub"). For Miss Mosquita, the IF offset must be added, so hold the button pressed for a second while the display shows "Add". When "Add" begins to flash, the counter has permanently saved the new offset. Release the button, and you are back in normal operation mode. If your counter is equipped with an old firmware, there may be no entry for "3.9990 MHz" in the preconfigured table of frequency offsets. 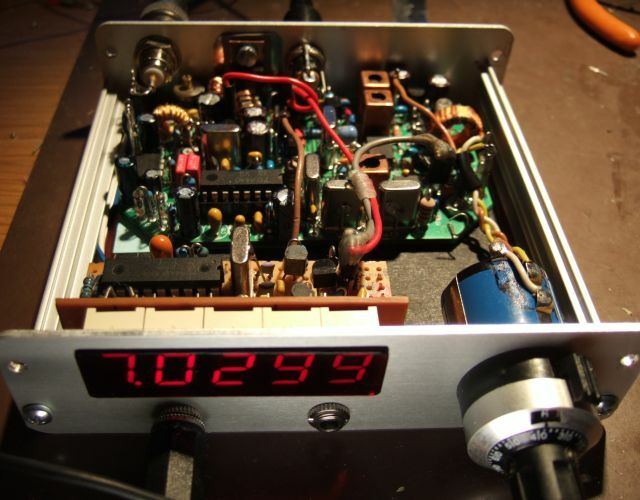 In this case, you can enter the offset as described in the firmware documentation for DL4YHF's PIC-based frequency counter (temporarily connect the counter to the oscillator in the TX-mixer, which delivers the 3.9990 (+/-) reference). If the relative link doesn't work, try this absolute link. Additionally, you can activate the power-saving option in the counter's setup menu (toggle "PSAVE" and "NoPSV" in programming mode). If the power-saving option is enabled, the display will be turned off if the VFO frequency doesn't change by more than a few dozen Hertz within 15 seconds, and turned on as soon as the VFO frequency changes again (=operator turning the VFO knob). 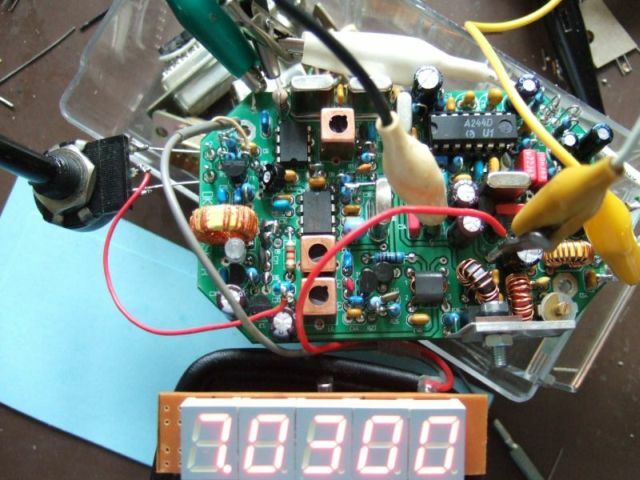 During power-saving mode, the display flashes up once every 10 second to show that the transceiver is still on. This mode can save up to 15 mA of battery current. 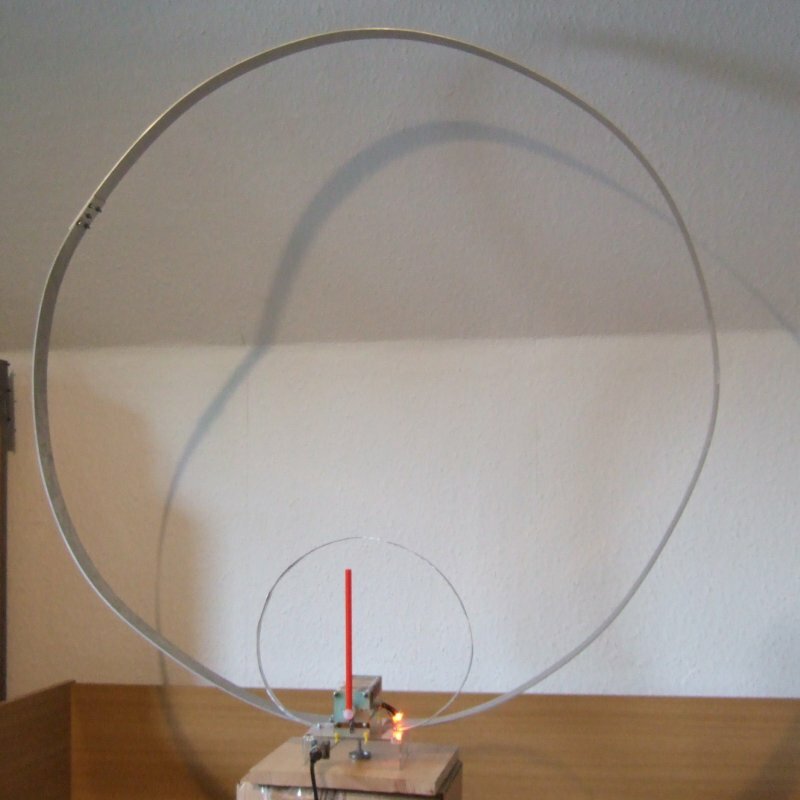 In the author's prototype, the average total DC current during RX for receiver+counter dropped from 45 mA to 32 mA with the power-saving mode.